It is announced today that the acclaimed production, celebrating the music of the King Of Pop, will be at the London Palladium for one night only on Saturday, 6th April 2019. And Michael Jackson fans will be wowed by Ben Bowman who stars in this concert production, supported by a stunning live band. Ben not only looks and sounds like Michael Jackson, but has honed his routine so impeccably that audiences believe they are watching their hero. Tickets go on sale at 10am on Friday, 8th February 2019. Ben Bowman is in demand across the world for his shows, which have been hailed as the most exciting tribute of the King Of Pop to have ever toured UK theatres. In 2019 Michael Starring Ben is already playing more than 40 theatres across the country and promoters Cuffe and Taylor and James Baker Productions are delighted to now be giving the show its West End premiere. Speaking about the London Palladium show, Ben said: “I’ve spent so many years working towards this moment, to be able to bring Michael Starring Ben into London’s West End – and more than that, to the incredible theatre that is the London Palladium is beyond my dreams. “When I think of all the massive stars who have performed there over the years, I cannot wait to celebrate the music of my hero Michael Jackson on that famous stage. 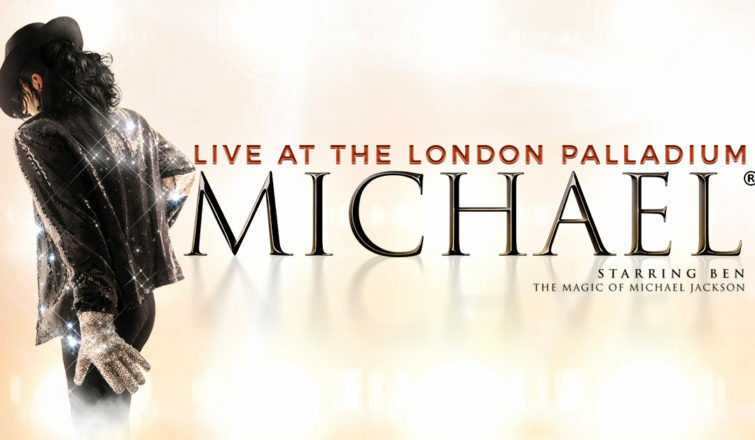 Cheryl Nicholls, Cuffe and Taylor’s Theatre and Special Projects Promoter, added: “We are thrilled to be bringing Michael Starring Ben to the London Palladium for its West End premiere. “Ben works so hard to create this fantastic night of music from one of the world’s greatest ever entertainers, and fans are in for an absolute treat to be able to see the show at the Palladium. Michael Starring Ben features not only the greatest hits of Michael Jackson but also The Jackson 5. The show brings together a fresh blend mixing elements of Jackson’s own stage shows with exciting new arrangements combined with a stunning light show to create the perfect celebration of Michael and his music.